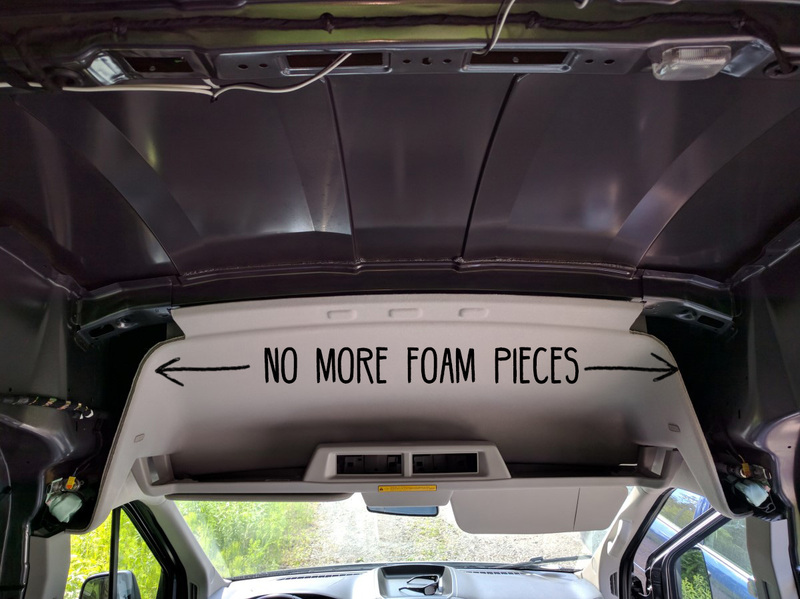 The Ford SVE Bulletin (Listed in Resources just above) advises AGAINST the modification of the foam blobs, since the modification could damage or prevent the airbags from deploying properly. We don’t recommend modifying them! Yes, that includes covering them with fabric. If you decide to do so, do it at your own risks! The foam blobs are covered with fabric; we used 3M 90 adhesive to hold the fabric in place. If you go that route, test it before: too much adhesive and you will stain the fabric. With the blob funky shapes, it is a lot of work to get a nice coverage without wrinkles… It does not have an OEM look, but it’s fine with us! The area shown above was filled with Thinsulate leftovers to make a nicer transition. Who’s NOT satisfied with the result? Isabelle is not satisfied with the result! To keep to option of removing the foam blobs, we fabricated a foam plug for each plastic pin. We can remove that plug to access the plastic pin and remove the foam blob. To make a nice transition between the ceiling and the overhead storage, we fabricated a “L” shape in plywood that we covered with fabric. No need to drill the metal! …And now it’s time to promote (again) our Cross Nut article! We decided that covering the foam blobs with fabric is safe. Will we die? Probably. You guys are the bomb! we finally started our interior build, step by step according to your build journal. We have a 144 though so we had to make slight modifications…No Big Deal! My GF and I are not wood workers or electricians, but your instructions are easy to follow! Thanks for putting this out for all the world to see. Hey guys! Quick question. When you removed your foam blobs, did you see the airbag behind it? Do you know if every Transit cargo van has them? I don’t see anything behind our foam blobs, so I’m confused about where these airbags are located and why this foam would do anything for them. Can’t tell exactly what role the foam blob play, but Ford is pretty straightforward about that: no modification… oh well.